During the last couple of years level scaling has become pretty common in MMO space. Level scaling means that whenever a player enters an area that’s of considerably lower level one of two things happens: the player is leveled down to the area’s level, or the mobs are beefed up to the player’s level. Some games, for example Guild Wars 2, launched with level scaling built-in, others like The Elder Scrolls Online, SW:TOR and WoW (to some extent) added it later on. The problem I have with the feature’s implementation in those games: I can’t opt out of it. If I travel to a low level area I’ll always be leveled down, whether I like it or not. The thing is, I do not like it most of the time, for a number of reasons. It feels so liberating to return to a zone I had to fight my way through back in the day and be totally ignored by all mobs, making for a relaxed stroll in the park. 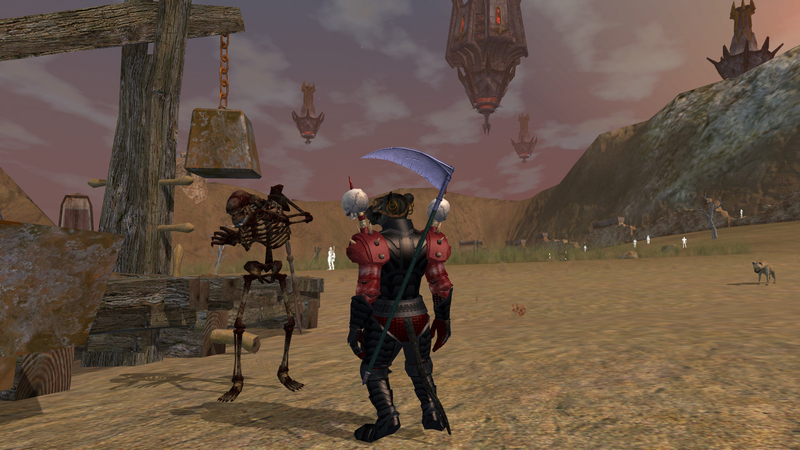 In Everquest II low level mobs even cower in fear before me when I walk past them, which I find hilarious. Yeah, that’s right! See what I did to your friends? It also makes a lot of stuff much less arduous, for example low level gathering, completing collections or killing mobs for old quests cluttering up the journal. I love these zero-stress activities every now and then. Speaking of killing stuff, this is where power creep also comes into play. While power creep and level scaling aren’t exactly polar opposites they are related insofar that the latter can offset some drawbacks, but also undo the nicer aspects of the former. Power creep happens when more powerful gear and abilities are introduced to a game (mostly by expansions), resulting in older gear becoming obsolete and older content ridiculously easy. I’ve experienced power creep that was decidedly too severe. I don’t think the very first items you get for easy solo quests after an expansion should be way more powerful than the best raid gear you could obtain before the expac. This makes you feel like your weeks and months of working towards that gear were for naught, and that’s not a pleasant feeling at all. Raid gear on the left, outclassed and outmatched by an ordinary quest reward (actually these aren’t quite comparable, but you get the idea). As long as it isn’t too extreme I’m fully on board with gear and abilities becoming more powerful over time though. Again, I like it when older content becomes much easier. 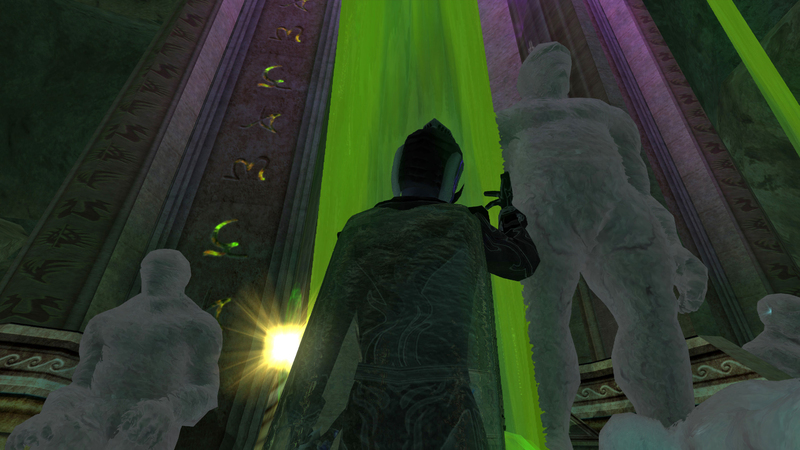 If you wait and level up enough in EQII you reach a point where you can solo raid bosses that were a tough challenge for 24 players way back when, and I think that’s great. Due to this you can, if not experience as intended, at least see all the content there is. If you look at it this way power creep actually has it’s upsides. Hi there! Remember me and all those wipes? Payback time’s here! But what about the huge advantages of level scaling and the massive drawbacks of power creep? What if I want to play together with friends who have joined the game much later and are significantly below me in level and power? Or maybe I want to deliberately play older content at the appropriate level, what then? Well, there’s a solution for that: player controlled level scaling. In EQII it’s called mentoring, and there are two flavours. When playing together with lowbie friends you can lower your level to the exact level of a group member, which is free and can be done anywhere and anytime. If you’re solo you can visit a chronomage and mentor yourself to a level of your choosing in increments of five for a small fee. The chronoguys even give out rotating daily missions as an incentive to do old content while mentored down. For me this is the perfect solution. I can enjoy and utilize my steady growth in power (and punch mobs that formerly gave me a hard time in the face), but reduce my level and power if I so choose at any time. Forced level scaling? Get off my lawn! I think in WoWs latest expansion the power creep is going to be nuts. We started out at 110 in the 240-250 range? I forget exactly. We are just over a week in and people are selling off 350 BoEs, are wearing 370 gear, and we haven’t gotten the first raids yet, or Mythic+ dungeons. I can easily see gear breaking 500 by the end of expansion, then having to maybe do another stat squish before the next. About that stat squish thing though, I learned about WoW doing this only recently, and I know that would annoy me even more than just numbers getting ridiculously high. SW:TOR did something similar when the level cap went up from 50 to 55. As long as you stayed 50 nothing changed, but with each level up your stats got worse and worse. It felt so bad, getting weaker instead of stronger with each level up. I know that they also changed stuff under the hood that made it work out just fine, but it still felt so wrong. They also tinkered with skill trees in a way that I didn’t like with that update, and I never really found my enthusiasm again for the game as a whole after that. I guess you could say that I grow very attached to my characters. Mess with them the wrong way, and I’ll neither forgive nor forget. It was a shock to go from 5 million health to 50,000, and doing 700,000 or more damage to 2,500. But in a week I am close to 100,000 health, but my damage is slow to increase. It will get better. But this is the time it feels underwhelming to play. I completely agree with almost all of this. I like level scaling but I’d much prefer it to be optional. I think EQ2 has it just about right, athough mentored characters are still incrediby powerful compard to an actual character of that level. EQ2 also now has “Level Agnostic” dungeons, where anyone (well, last I tried I think the range was 20-100…it may have changed) can group together and that works better than mentoring for giving everyone something like the same power level. Mentored characters are indeed very powerful, that’s one thing they could tune a bit (but probably won’t now that the feature has remained pretty much unchanged for so long). Good to know about the dungeon thing, that’s new to me. Thanks! This applies to at least SWTOR, and not sure about some others: If the mobs in the zone are, say, Level 18-20 – then many games will downlevel you to 22 or something. So yeah, you’re not the invincible Hero, but grinding the mobs for whatever reason is still quite quick (because your gear is not *really* Level 22, I think most games either deliberately or accidentally leave you too strong) – also they aggro as fast as if you were Level 20. Might be just an impression and not many games do this, but I think I saw it in more games than just SWTOR.